One of the most popular questions regarding marijuana is “How much marijuana can one plant produce?” or “How much will a 600 watt HPS yield?” There are no simple answers to this question as each situation depends on a number of variables. Many people take up growing weed and they have a variety of reasons for doing so. In every case, you want to get the most out of your crop. Whether you’re growing for medical reasons or you just want to make a little money on the side, the overall yield is a top priority for all growers. In this article I will discuss all everything there is to know about marijuana yields. Got questions or tips? Place them in the comments below this article. Although soil growing can potentially lower your yield, it also is easier to grow. This is because it not only creates a buffer for error but it also holds nutrients within the soil. When growing in soil, there is room to make mistakes with pH and TDS and pay for it in yield. In terms of numbers, expect a maximum of 1 gram per watt. That means a 600watt lamp can produce 600 grams of marijuana or 21 ounces. Growing hydroponically yields up to 20% more, as long as you do not make any mistakes. With hydro growing, there is no room for errors. You must be very careful about the TDS and pH levels because the roots are directly in water (and not soil) and incorrect levels can immediately effect the plants. Comments Off on How Much Marijuana Can I Yield Per Plant? A Pound! Experts working with cannabis claim that this plant in combination with coconut oil can become even more bio available. This means that the usage and absorption of nutrients will be higher by every system. The efficiency of the THC extraction is due to the richness of saturated fats in the coconut oil. Cannabinoids can also be absorbed by many other oils, such as butter, but coconut oil allows much better absorption. It is well-known that cannabis is a plant that is used in medicinal purposes and this fact is recognized by the medical institutions. If you didn’t know, people around the globe used cannabis for many years and numerous health issues were successfully treated like inflammation, menstrual pain, aches, insomnia, anxiety, swelling, depression and a number of other problems. But what’s intriguing is that that there are many ways to consume this plant: vaping, eating, smoking etc. There are many cases when people combined marijuana with other foods. But it turns out that using cannabis as infused in virgin coconut oil is the simplest and best method for medicinal purposes. Much like cannabis, coconut oil has numerous benefits to our health and that’s why it’s used in hair and skin care products. Coconut oil can help boost the immune system and the digestion. It has great amount of lauric, caprylic and capric acid. They are all known for their antibacterial, anti-fungal and antimicrobial properties. The mix of marijuana and coconut oil produce cannabinoid which is extremely powerful remedy consumed with food, used externally or taken as a capsule. Only a half teaspoon of coconut oil and a couple of few drops of medicinal cannabis boost the bio availability of this remedy. If you want to make Cannabis with Coconut Oil, put 1 gram of de-carboxylate cannabis for each ounce of coconut oil. Put the crushed marijuana into a glass container and add coconut oil. Close the container, sealing it well and then put it in water-filled pan. Heat the water slowly and maintain it below the boiling level for one hour. This way you will prevent the oil from overheating. Then, strain the resulting mixture to remove the solid parts and squeeze the juice from the marijuana. Many people strain the mixture using cheesecloth. After you complete this procedure, you can consume the cannabis with coconut oil like that, add it in foods or use it as lotion. You can cook with this oil, but only when the temperature is below 315 F. This is the boiling temperature for active compound of cannabis. If you heat the oil at higher temperatures its effects will disappear. My mother, for all intents and purposes, is relatively square. She listens to Rush Limbaugh every morning while working around the house and likes to relax in the evening to a good old-fashioned black and white movie. Needless to say she has never been much of a partier, let alone a drinker or a smoker. However my mother for many years has been a supporter of cannabis being used to help ease the pain and suffering of people diagnosed with cancer. Recently my mother herself was diagnosed with cancer. Along with the diagnosis came an uncomfortable feeling of uncertainty and helplessness that was amplified by the harsh reality of financial burden and medical ambiguity. Through it all my mother and I not only have gained a heightened awareness of the medical communities lack of understanding in regards to cancer itself, but also we have gained the knowledge of a truly effective cure. Even in a time when medical marijuana is accepted, there is still a misconception about its medical use. Many doctors will admit that some of the compounds found in cannabis are effective in treating the side effects of chemotherapy, but the current medical establishment objects to cannabis and its chemical compounds being used for anything else. This is the same medical establishment who has spent numerous years and countless billions developing a cancer treatment plan that even doctors won’t expose themselves to. Scientists from the McGill Cancer Center asked 79 doctors, all experts on lung cancer, if they themselves were diagnosed with cancer would they consider using chemotherapy. Of the 79 doctors 58 said they would not expose themselves to chemotherapy due to “the ineffectiveness and the elevated level of toxicity of chemotherapy” (Day). So would using cannabis to treat cancer be more effective and less toxic than chemotherapy? Before exploring the medical benefits associated with cannabis as an alternative cancer therapy, it is necessary to have a clear understanding of what exactly cancer is. According to the National Cancer Institute, cancer is divided into several categories: carcinoma, sarcoma, leukemia, lymphoma, melanoma and central nervous system cancers. In spite of the different names and locations of these cancers in the body, they all share a common process (National Cancer Institute par. 1). Cancer cells start off as normal cells in the body, but somewhere in the cells life cycle of growth and death something happens to these cells that prevents them from dying. Rather than completing the normal cell life cycle, they instead keep growing in a specific location of the body until a cancerous lesion or tumor is created. If small groups of cancer cells break away from the main group of cancer cells they will find away into the blood stream where they travel to other parts of the body and begin to grow in a new location. So what causes these normal cells to mutate and form cancer cells? According to report published by the American Society of Microbiology “Candida albicans is the most common human fungal pathogen” (Noble and Johnson par. 1). Also the Centers for Disease Control and Prevention reports that “Candida is the fourth most common cause of bloodstream infections among U.S. hospital patients” (Center for Disease Control and Prevention par. 1). As to its probability of causing cancer the Department of Biology at Youngstown State University in Ohio found that “inoculation of C. albicans produces numerous tumor-like lesions and abscesses on the major organs of experimental laboratory rats” (Department of Biology par. 1) However it is unethical for a doctor or a scientist to purposefully inject a human subject with Candida albicans, so the likely hood of such important data being collected is impossible. Fortunately there was study done by the Institute of Clinical Medicine in Aarhus, Denmark showing that out of 21,247 patients with Candida albicans 100% of them were diagnosed with some form of cancer within 10 years of contracting Candida albicans (Department of Clinical Epidemiology par. 2). These facts point to Candida albicans as being one cause of cancer, but there are numerous other chemicals and pathogens that are said to be carcinogenic. What is the probability of Candida albicans being the sole cause of cancer? To explore this theory it is imperative to know how the fungus interacts with the human body. According to a report by the American Society for Microbiology “All humans are colonised with Candida species, mostly Candida albicans” (Achkar and Fries par. 1). For the most part Candida albicans lies dormant within the human body, however when certain levels of PH in the stomach or blood stream are reached Candida albicans begins to accelerate its growth. The normal PH levels of the human stomach are 1.5-3.5 PH (very acidic) and normal blood stream PH is about 7.4 PH (alkaline). The Tohoku Pharmaceutical University in Sendai, Japan found that the optimal level for Candida albicans growth was between 4-7 PH (Department of Microbiology par. 1). Coincidentally Dr. A.K. Brewer discovered that by temporarily raising the blood PH of 30 human cancer patients with alkaline (base) elements to a level of 8 PH, he was successfully able to completely eliminate the cancer in all 30 patients, some patients tumors were eliminated within 12-36 hours (Brewer par. 1). Candida albicans is not only a fungus but it is also considered yeast. According to S. Baron, editor of Medical Microbiology “Small molecules (e.g., simple sugars and amino acids) accumulate in a watery film surrounding the hyphae or yeast and simply diffuse through the cell wall” (Baron par. 1). Glucose (sugar) is the main source of food for all cells in the human body, but it is also the main source of food for Candida albicans. By stealing the glucose from the cells of the body the yeast begins to multiply faster, quickly eating away the tissue of vital organs. Like brewers yeast, Candida albicans converts sugar into alcohol, however this alcohol is not ethanol (vodka), but acetaldehyde (the chemical that causes hangovers) (Oral and Maxillofacial Pathology Unit par. 4). Coincidentally, scientists at Keele University in Trent, U.K. made “the discovery that acetaldehyde is released by the lung cancer cell” (Center for Science and Technology in Medicine par. 1). Due to the acidity of acetaldehyde the average PH level in the blood stream drops creating an optimal PH range for Candida albicans to spread through out the body. This theory of cancer being the result of fungus seems like a fairly logical conclusion, but do any reputable medical institutes dedicated to the advancement of cancer research share this same conclusion? In May of 2013 the U.S. National Cancer Institute tested an antifungal medicine named “Compound 3c” and found that the medicine “showed high activity against HOP-92 (Non-Small Cell Lung Cancer)” (Heterocyclic Compounds Research Group par 1). Apparently these results were so promising that a few months later in October of 2013 scientists form Gaziosmanpaşa University in Tokat, Turkey carried out similar experiments with similar results when testing their antifungal compound on cancer cells. In light of these positive findings, scientists from the Faculty of Marine Sciences in Jeddah, Saudi Arabia began testing an antifungal compound derived from the plant Saraca indica on cancer cells and published their findings in November of 2013. Shortly after that, a group of scientists from the University of Calabria in Rende, Italy extracted antifungal chemicals from Citrus seeds with the intent of using this extraction to treat cancer. Which brings us to the most talked about, most tested, most studied, most published plant derived antifungal and anticancer compounds in modern history, cannabinoids. According to the National Cancer Institute “Chemical components of Cannabis, called cannabinoids, activate specific receptors found throughout the body to produce pharmacologic effects, particularly in the central nervous system and the immune system” (National Institutes of Health par. 1) There are literally hundreds of reports regarding the anti-tumor properties of cannabinoids published by the National Institutes of Health. 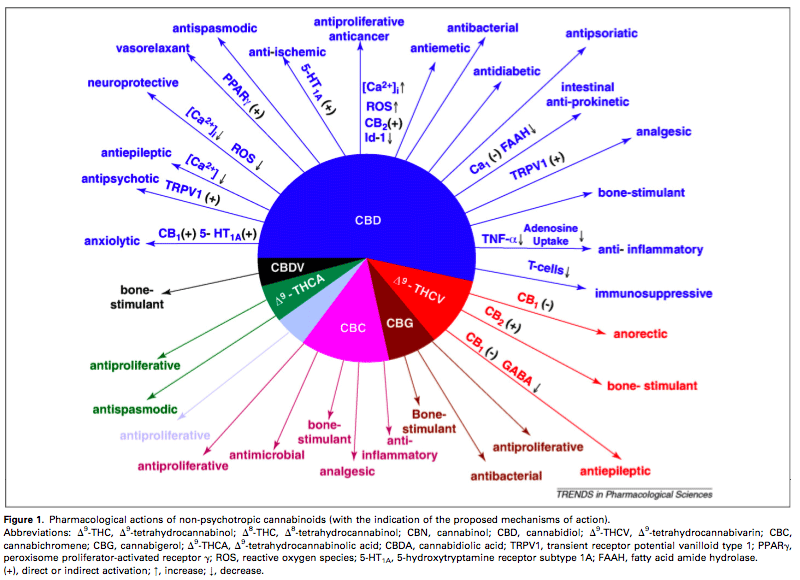 One of these reports reveals how scientists had analyzed “the pathways triggered by cannabinoids to induce apoptosis” (Department of Experimental Biomedicine and Clinical Neuroscience par. 1) in cancerous tumors. Apoptosis is a condition were the body literally commands a certain group of cells to die, in this case cannabinoids trigger a mechanism in the human body that sends this command specifically to cancer cells. More fascinating still is the discovery made by scientists from Periyar University in Salem, India regarding the highly effective anti-fungal properties of cannabinoids when applied to samples of cultured Candida albicans. Currently the cannabis plant, DEA number 7360, is considered a schedule I drug according to the U.S. Department of Justice. This means that there is absolutely no medical value associated with cannabis. However in 2001 the U.S. Department of Health and Human Services filed a U.S. patent on cannabinoids sighting that “cannabinoids are found to have particular application as neuroprotectants, for example in limiting neurological damage following ischemic insults, such as stroke and trauma, or in the treatment of neurodegenerative diseases, such as Alzheimer’s disease, Parkinson’s disease and HIV dementia” (United States par. 1) This is an obvious contradiction in U.S. drug policy. Through the trials and tribulations of cancer, my mother and I have gained these key points of knowledge: 1. Cancer and tumors are not a disease, they are the bodies immune response to a foreign pathogen. 2. Candida albicans is the pathogen that triggers the body’s immune system to produce what doctors habitually misdiagnosed as “cancer”. 3. The cannabis plant contains chemical compounds called cannabinoids that have been proven to be a safe, low cost and effective treatment against life threatening Candida albicans infections. Doctors, pharmaceutical companies, law enforcement officers and politicians all tremble with fear as they begin to realise that the angry mothers of America unite with this new found awareness regarding “cancer”. These angry mothers will impose a social, economical and spiritual retribution in the names of all friends, cousins, sisters, daughters, granddaughters, aunts, mothers and grandmothers who fell victim to the carefully crafted illusion of “cancer”. This retribution, the likes of which no fascist has ever seen, will be wrathfully administered the moment these angry moms realise that more women have died from a lie than a disease. VANCOUVER — Travis Lane has been growing marijuana since high school, when his first pot plant swiftly withered and died in his bedroom closet. By the time he was 20, he had cultivated a small basement grow-operation. Now in his mid-thirties, Lane owns an online dispensary and runs two 390-plant operations on Vancouver Island. He employs two growers and raises his plants without pesticides or liquid fertilizer. Lane holds two Health Canada licenses for the grow sites, making his pot production legal for medical purposes. But with the federal Liberals committed to legalizing cannabis for recreational use, Lane is among the smaller-scale growers fighting for a seat at the table. “It’s going to be the National Energy Program all over again, but instead of Alberta and oil, it’s going to be B.C. and cannabis,” said Ian Dawkins of the Cannabis Growers of Canada, referring to the 1980 policy that infuriated Albert-ans when the federal government tried to gain more control over the oil industry. His group, a national trade association representing small and medium-sized pot growers and vendors, recently commissioned a report on B.C.’s cannabis industry. Economist Larissa Flister used Colorado, a similarly-sized state with legal pot, as a proxy to estimate that about 13,700 people have marijuana-related jobs in B.C. It’s a rough figure that’s impossible to verify due to the illegality of the jobs, but several estimates have pegged the value of B.C.’s pot industry at between $2 billion and $7 billion. Dawkins pointed to the federal Liberals’ cautious tone, and intense lobbying by large licensed producers, pharmacies and liquor stores, as signs the government could be headed towards a strict regime without space for smaller growers or dispensaries. “If you’re selling cannabis in a liquor store, in this tightly-controlled regulatory environment, you’re not creating tourism. There was no winery tourism in B.C. until they began to DE-regulate the winery sector and allow for all these wineries to pop up in the Okanagan,” he said. Teresa Taylor, a founding director of the Craft Cannabis Association of B.C., warned that if an “elitist” legal system is created, the black market will flourish. She said craft cannabis growers are “ma and pa” farmers who care about producing a high-quality product. “In order for us to continue to have strong local economies, the legislative model needs to include that level of production. I think it would be akin to losing something like the forestry industry or mining or fisheries,” she said. He said Canadians have already proven they dislike a system that limits marijuana sales to big companies. In February, Conroy won a constitutional challenge of 2013 legislation that required medical cannabis patients to buy from large licensed producers. Court rulings aside, legalizing pot still a pipe dream. There were few subjects the former federal Conservative government despised more than pot. It knew where the majority of Canadians stood on the issue – in favour of legalization – but it also knew that the party’s core supporters would have no part of that. There may have been no better illustration of the struggles the Tories had with the matter than the system it created for the licensing and distribution of medical marijuana, the same one that was discredited and toppled by a Federal Court judge Wednesday. Once upon a time, Canadians with authorization from a physician could grow their own cannabis plants or designate someone to do so for them. Under that program, the number of production licences went from fewer than 500 in 2002 to more than 22,000 by 2012. Uncomfortable with the proliferation of both users and growers, and unwilling to give Health Canada the budget to properly monitor and audit the system, the Harper government decided to change the rules. Under the new plan, the number of growers was restricted and their operations more tightly controlled. Products had to be ordered online. Costs for users became prohibitive, which was either by design or a happy consequence for the anti-pot government (depending on which theory you subscribe to). It didn’t take long for a disgruntled group of users to win a court injunction against the new structure. It was that challenge that led to the ruling that came out this week. This is a good thing. The program set up by the Conservatives was designed to fail. After the injunction was granted, both the old and new systems were allowed to operate concurrently. This created a mess that the former government had no appetite for dealing with. In the absence of any leadership, dispensaries started popping up in Vancouver, almost in defiance of Ottawa. Now the matter is in the hands of the federal Liberal government, which campaigned on the promise to legalize marijuana. The new government has been given six months to straighten things out in terms of medical marijuana. Most likely, it will create a new plan that is a hybrid of the two existing models. It will give users the choice and accessibility to which the courts say they have a constitutional right, with the control over the substance (including standardization and testing) that is necessary. What it does about the illegal dispensaries that have sprung up across the country is anyone’s guess, although it’s difficult to imagine a scenario in which a government intent on legalizing the drug tries to shut them all down. That ship has sailed. If nothing else, the Federal Court ruling has drawn attention to the enormous stakes that surround the multibillion-dollar marijuana industry. Everyone wants a piece of it, including, as we learned this week, pharmacy chains such as London Drugs and Shoppers Drug Mart. Many are poised for the day pot is finally legalized in Canada, a day some believe is just around the corner. Marijuana will not be coming to your nearest government-regulated outlet any time soon. The Liberals are discovering that legalizing marijuana is easier in theory than practice. It would have an impact on international treaties, and there are complex border issues to be resolved. There are the country-wide consultations the government has committed to undertaking. There is a strong chance pot will still be illegal, technically at least, by the next federal election. The good news for recreational users who don’t have illicit sources is that it has never been been easier to obtain. There are about 500,000 medical-cannabis users in Canada over the age of 25, according to Health Canada. The number has sky-rocketed in recent years. Why? Because anyone complaining of the slightest bit of pain can get a prescription. Walk into some of the storefront marijuana dispensaries in Vancouver and you don’t even need that. Is any of this likely to change as a result of this week’s court ruling? Nope. Probably the most significant outcome of the decision is that now people will be able to grow pot in their homes without fear they’ll be thrown into jail for doing so. Comments Off on Court rulings aside, legalizing pot still a pipe dream. “This research provides data on the development of 59 Jamaican children, from birth to age 5 years, whose mothers used marijuana during pregnancy. Approximately one-half of the sample used marijuana during pregnancy and were matched with non-users according to age, parity, and socioeconomic status. Testing of the children was done at 1, 3, and 30 days of age with the Brazelton Neonatal Behavioral Assessment Scales and at ages 4 and 5 years with the McCarthy Scales of Children’s Abilities. Data about the child’s home environment and temperament were collected from direct observations as well as from standardized questionnaires. Marijuana in Canada is a hot topic of late. Since the autumn election of a Liberal government guaranteeing legalization, it’s a subject making headlines on a regular basis. Parliament is not yet in session; there is no budget; the Loonie and oil prices have plummeted; and there are other election promises to keep. Given all that, it’s no surprise that beyond the appointment of Bill Blair there has been little heard from the federal government regarding plans or a timeline for marijuana legalization. That’s no surprise as there is a lot of conjecture from experts regarding the length of time legalization could entail. To fill the void there have been a lot of individuals weighing in with how they’d like to see legalization realized. Provincial politicians and union leaders have been very vocal in their support of recreational marijuana being sold through existing government-run liquor stores. This has caused some debate as to how a retail model for recreational marijuana should be developed in Canada. There has also been a large increase in the number of dispensaries across Canada. Primarily in Toronto where they’ve been sprouting up like ‘weeds’. Outside of Canada’s largest city, dispensaries have been a mainstay of the urban landscape in Vancouver for a long time now. So much so that the City of Vancouver decided to step in and regulate them with a dispensary licensing process. Dispensaries are doing great business. Although they ostensibly sell only to medical patients, it is more than clear that many of these storefronts – especially those that have opened up most recently – are aiming to capitalize on the pending legalization by getting in early, accepting patients that don’t always meet patient requirements and generating revenue while there is a lack of regulation from local authorities waiting for word from on high. This is unsurprising given that the CMCIA is an association representing the Licensed Producers (LPs) that are approved to produce medical marijuana for Canadians with valid prescriptions under the Marihuana for Medical Purposes Regulations (MMPR). The MMPR came into effect on April 1st, 2014 and is supposed to be the only manner in which patients can legally access their cannabis medicine. And no, it’s not a typo, they spelled it with an ‘h’. These LPs are the few companies that have managed to pass the rigorous and ever changing demands of the Health Canada LP application procedure – an expensive and time-consuming process that has benefited 27 companies to this point. These companies have until recently been permitted to provide only dried marijuana to patients. If the injunction resolves with patients not allowed to grow, then personal recreational growing is certainly unlikely. Conversely if the decision alters the MMPR to allow patients to grow, Canada could take heed and follow regulations that have been developed south of the border. If the injunction goes in favour of the plaintiffs, patients and designated growers will be allowed to produce marijuana – albeit most likely at much lower plant numbers – and dispensaries could continue to have ready and available access to the wide variety of products they currently offer. However a recent Supreme Court of Canada decision in June 2015 (R v Smith) allowed patients to access marijuana extracts and subsequently four companies have been licensed to provide oil products to patients. So far these oils are prohibitively expensive and must meet specific Health Canada guidelines regarding THC concentration and viscosity at room temperature. A far cry from the virtual cornucopia of concentrate types offered at most dispensaries. There are approximately 40,000 MMPR patients being served by the LP companies and it’s no question that LPs would love to see that number jump significantly. But they believe the dispensaries are undercutting them by offering products to the LPs’ customer base that they themselves are legally prohibited from producing and by preempting potential patients from seeking an MMPR prescription. There are simply more options, easier access, and first-hand information at the local dispensary. Dispensaries have a competitive advantage. But where do these ‘grey market’ dispensaries source their product? Before the MMPR there was the Marihuana Medical Access Regulations (MMAR) legislation. Under this program patients were provided with an Authorization To Possess (ATP) license and could source their marijuana from Health Canada, grow their own, or designate someone as their grower. People that became designated growers for themselves and one other (to a maximum of two people total) were allowed to grow and store a specific number of plants and marijuana respectively. The number of plants was predicated on the patient’s prescription – Health Canada’s guideline indicated that a 5g/day prescription allowed up to 25 plants on site. So depending on the daily prescription and number of patients, one grower could legally possess quite a few plants. There were thousands of growers registered under the MMAR scheme producing marijuana in 2014. And I think it’s safe to say that any one person with a few hundred plants is likely producing more than enough medicine. Although the growers must provide their growing and storage address plus meet inspection requirements, without a sufficient number of auditors for these designated growers who’s to say they weren’t producing more than their legal limit? It’s fairly common knowledge that dispensaries source some, most, or all, of their product from MMAR designated growers. There is little Health Canada can do about this since they designated the number of plants and allowed them to grow. There is little law enforcement can do about this since they likely don’t have the manpower to visit every grower and don’t have any evidence growers are exceeding their limit. Further, patients visiting dispensaries are unlikely to face prosecution. The group most at risk for arrest and prosecution is the dispensary operators themselves. You might ask, why the designated growers are still allowed if the MMPR was designed to replace the MMAR? The LPs under the MMPR are now supposed to be the only legal source of marijuana in Canada. As part of the transition from the MMAR to the MMPR Health Canada required all patients and growers to destroy their plants and stored marijuana before transitioning to the LPs as their sole source of medicine. In response Neil Allard and plaintiffs, with John Conroy as their lead counsel, launched an case against the government arguing that forcing them into the MMPR program would be prohibitively expensive and deny them access to their medicine. With prices from LPs ranging on average from $6-12 a gram depending on strain it’s a valid point – especially when you can arguably grow your own for under or around $1 a gram. The government has argued, amongst other things, that there is compassionate pricing available for low income patients and home growing does not have the quality standards industry is required to meet to ensure people have safe medicine that will not be diverted to an illegal market. Without giving bias, it’s important to point out that personal growers are just growing a plant, not manufacturing their own chemotherapeutic drugs. Plus many, if not most, future patients will still sign up and purchase marijuana from LPs rather than grown their own. In either case, both sides have made their arguments and we now await the decision from Justice Phelan. The outcome of the Allard injunction could have long lasting ramifications on how patients are allowed to source their own medicine. If patients have the right to grow amended to the MMPR, it could also impact how legalization unfolds. It could influence whether or not people will be allowed plants for recreational growing. If the injunction resolves with patients not allowed to grow, then personal recreational growing is certainly unlikely. Conversely if the decision alters the MMPR to allow patients to grow, Canada could take heed and follow regulations that have been developed south of the border. Of the areas in the United States allowing recreational marijuana, Colorado, Alaska, and Washington, DC, allow six plants per person; in Oregon it’s four; while Washington state doesn’t allow any personal plants. This growing hasn’t seemingly put a dent in sales or tax revenue. It could be that Justice Phelan looks to these examples in determining how patients should be allowed to grow their medicine. In the meantime the injunction has allowed growers under the MMAR to continue producing marijuana until a decision is reached. Much of which may or may not be finding its way into dispensaries. If the injunction goes in favour of the plaintiffs, patients and designated growers will be allowed to produce marijuana – albeit most likely at much lower plant numbers – and dispensaries could continue to have ready and available access to the wide variety of products they currently offer. Of course, they could also experience a dip in supply if Justice Phelan requires significantly reduced grow limits. But it is likely that this will be just a small amount of slack that is quickly taken up by growers ready to flout any cultivation limitations. Or supply to storefronts could originate from future cooperatives that spring up and are designated to grow for a large number of patients, in the event the court makes this possible with an amendment to the MMPR. Examples of this exist in the Unites States and Uruguay. In either case, it is likely that any amendments to the current legislation to allow medical marijuana patients to grow will result in continued diversion to the ‘grey market’. This will not favour the LPs and the CMCIA will not like it. If the injunction goes in favour of the defendants then the current source of marijuana for many dispensaries could go away as fast as the designated growers operations are shut down. Some dispensary operators have stated that they will only comply with a direct order to cease and desist operations from the city or police and will otherwise source product elsewhere. People were growing marijuana well before the MMAR existed so that shouldn’t be overly difficult. How Long Until a Decision on the Allard injunction? It could be weeks or months. No one can really say with any kind of certainty except Justice Phelan. And then there is the possibility of an appeal process. But it is likely that the decision will come down before any kind of legalization can be enacted. And that’s what people seem to have forgotten. Dispensaries are popping up all over Toronto and the CMCIA wants the federal government to clarify its position on dispensaries – in other words, shut them down. It’s still too early to expect legalization as a new source of revenue. If the marijuana supply to dispensaries slows drastically or dries up completely, many will be forced to close. On the other hand a favorable decision for Allard et al. could be seen as a de facto mandate to further expand marijuana storefronts. This could result in further sluggish progress of the LP industry until legalization. The most immediate factor that could determine how the present state of marijuana distribution in Canada develops could be determined by the Allard injunction. Canada’s 26 licensed medical marijuana growers are in for a busy 2016 if predictions in a recent report by Investor Intel prove accurate. Dr. Luc Duchesne – in a column spotlighting Calgary grower Aurora Cannabis Inc.’s approval from Health Canada to sell to licensed medical patients – predicts a “significant market explosion” in the field of legal marijuana. “The newly elected Liberal government has recently reinforced its commitment to legalize recreational marijuana, and I speculate the government will use Health Canada’s licensed growers as a path to broadening access to marijuana,” writes Duschene. In the first quarter of 2015, Health Canada reported that more than 2,200 kg of medical marijuana was produced in Canada. Sales were just over 1,300 kg/quarter, with the average person consuming 1.1 gram per day. Assuming 10 percent of Canadians continue to consume that amount of pot, the demand would skyrocket – to 356,400 kg/quarter, or 1,425,600 kg per year. The current production rate can only meet 0.6 percent the potential demand, writes Dr. Duchesne, suggesting room for plenty of additional growers to seek approval to grow for Canada’s medical market. It’s important to point out, however, that his projected rate of consumption, which is based on data from medical patients, is probably a little high. Most recreational cannabis users wouldn’t be sparking up a 1 gram joint every single day (although if you’re into that, more power to you). Still, according to Duchesne’s estimates, if cannabis is sold at $5 per gram, the market could be worth more than $7-billion per year with direct tax benefits of $499-million per year to the federal government alone. And that’s projected impact of sales in Canada. If stronger national systems of cannabis regulation and quality control continue to develop, Dr. Duchesne believes the potential for additional revenue streams exists in an international market for Canadian cannabis. Although it’s extremely hard to narrow it down, below is a list of what we feel are the 10 most important cannabis-related studies released so far this year. We’ll revisit this again once the year is officially over. Activation of the endocannabinoid system – something done naturally by cannabis – can attenuate newborn brain injury caused by germinal matrix hemorrhages, which is one of the most common and devastating cerebrovascular events that affect premature infants. This is according to a May study published by the U.S. National Institute of Health. Cannabis greatly improves the healing process of broken bones, and makes the bones harder to break in the future, according to a July study published in the Journal of Bone and Mineral Research. An April study published in the journal Annals of Clinical and Translational Neurology found that activation of the body’s cannabinoid receptors can rescue learning and memory after a traumatic brain injury. Tetrahydrocannabinol (THC) may prevent the rejection of organs during a transplant, according to a study published in the September issue of the Journal of Leukocyte Biology. A study published in the journal Molecular Oncology, and published online by the National Institute of Health, found that the cannabis compound cannabidiol inhibits the growth and metastasis of highly aggressive breast cancer. The study was published in February. An April study published by the journal Psychopharmacology found that the body’s cannabinoid receptors play a vital role in the management of social interactions and aggressive behavior, and that administration of a cannabinoid receptor agonist (meant to mimic the effects of cannabis) significantly reduces aggression. ∆9-tetrahydrocannabinol (THC) – the primary psychoactive compound found in cannabis – inhibits melanoma tumor growth, according to a study published in the most recent issue of the journal Life Science, and published online by the National Institute of Health. Melanoma is the most dangerous form of skin cancer, killing over 10,000 people a year. A study funded by the National Highway Traffic Safety Administration, and released at the beginning of the year, found that driving after smoking cannabis does not make you more likely to get into a car crash. Consuming at least one joint a day for 20 years has no negative effect on a person’s lung health, according to a comprehensive study published in the journal Annals of the American Thoracic Society, and published online by the National Institute of Health. A study published by the Oxford journal Carcinogenesis, and published online by the U.S. National Institute of Health, has found that the cannabis compound cannabigerol can prevent the progression of cancer cells formed in the colon. A study published in April by the American Journal of Clinical and Experimental Urology, and published online by the National Institute of Health, found CB1R (cannabinoid receptor type 1) activiation, which occurs naturally through the consumption of cannabis, can treat pain arising from cystitis (urinary tract infection). Daily cannabis use among U.S. college students now exceeds daily cigarette use, according to a new study conducted by researchers at the University of Michigan. Given that cigarettes are fatal and highly addictive, and cannabis is neither of those things, this is definitely a positive development, and one that signifies the acceptance of cannabis into mainstream culture. A history of cannabis use is associated with a lower likelihood of obesity and diabetes, according to a study published in the journal Obesity. You Can find our list of the top 10 cannabis studies of 2014 by clicking here.